We sampled another Las Vegas McDonalds for breakfast and headed down the strip to see more casinos. We stopped at various places and tried our luck. 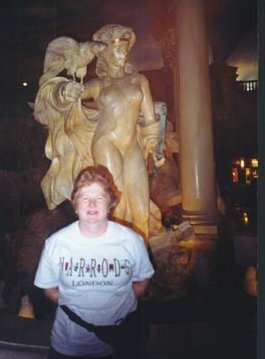 Eventually we made our way to Caesars Palace to gamble and visit the Forum Shops. We had lunch at Bertolini's Authentic Trattoria "outdoors" underneath the artificial sky. Unlike the Grand Canal Shoppes at the Venetian, the sky at the Forum Shops didn't quite achieve perfection. There were shadows on the ceiling that gave away the illusion but the change from afternoon sky to late evening sky was interesting. Since we took our seats right as the sky changed to night, we had to wait for the sky to lighten up at "dawn" to read the menu. The dining area at Bertolini's is next to a group of statues and fountains that are replicas from historic Rome. Here's Diana with a statue of the huntress Diana near Bertolini's. After the Forum Shops, we moved on to save Atlantis. We tried the Race for Atlantis IMAX 3-D ride. But first, we enjoy the Fall of Atlantis fountain show and the 50,000-gallon salt water aquarium. Take our word for it, the aquarium is better than the Race for Atlantis ride. The aquarium actually had a person mingling with the fishies. We moved across Flamingo Road to the Bellagio. The Bellagio had the plushest casino we saw in Las Vegas. The seats were soft leather and the cards on the video poker machines had the Bellagio logo on the backs. We left the Bellagio by taking a tram directly to the Monte Carlo. We don't remember anything about Monte Carlo except lemonade at Nathan's Hot Dogs. David was looking forward to Paris Las Vegas. He envisioned sidewalk cafes, street vendors selling crepes, and walking underneath the Eiffel Tower, looking up at the tower just like in Paris, France. Unfortunately, Paris Las Vegas was nothing like Paris, France. At best, it was a poor caricature of the real thing. The casino was underneath the Eiffel Tower and their artificial sky looked like blue ceiling with painted clouds in a child's room. 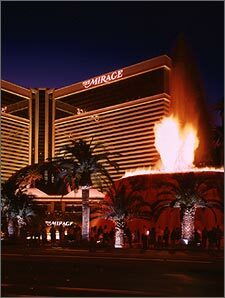 On the way back to our hotel, we stopped across the street from The Mirage to watch the volcano eruption. We could feel the heat from across The Strip, all 10 lanes.